In 2016, Maya Rosas was elected to the Uptown Planners, a board that advises the San Diego Planning Commission on land use. Rosas was much younger than the other members and quickly became it’s leading advocate for building more housing, raising heights and increasing density. When I interviewed Rosas in 2017 for my book, Generation Priced Out: Who Gets to Live in the New Urban America, she was still an outlier in San Diego. Although millennials were being priced out of the city, there was no organization to unite them behind a pro-housing agenda. That changed in 2018. And how it happened offers lessons to those in other cities looking to build YIMBY organizations. As the 2018 election was heating up Rosas had an idea. As a Democrat she wanted to weigh in on local candidates and ballot measures addressing what she saw as the most important local issue that no other Democratic group was addressing: housing. To elevate the housing issue Rosas formed the YIMBY Democrats of San Diego County. She made the organization a chartered Democratic Club to increase the group’s credibility with elected officials and other activists. To launch the group Rosas and several other YIMBYs scheduled a big kickoff event to coincide with the 2018 California Democratic Party gathering in San Diego. Politicians eagerly embraced the launch either by attending or being listed as honorary co-hosts. Since state legislators were in San Diego even out of county representatives like San Francisco State Senator Scott Wiener attended. The launch party for YIMBY Democrats proved transformative. Over 200 YIMBYs attended, showing that the launch had tapped into a huge base of pro-housing activists eager to join a group. Forty people joined as paid members ($25 per year) at the event and the group now has 150 members. Falconer is a Republican, but it is unlikely he would have even known much about YIMBY’s without the creation of the YIMBY Democrats. By using the term “YIMBY’” in its name, pro-housing activists have added to the term’s power. As people across the nation realize that fighting climate change requires infill housing barred by many local land use laws, support for pro-housing policies grows. The movement for infill housing and to end exclusionary zoning is also growing in response to the pricing out of the working and middle-class from the nation’s progressive cities. Millennials in San Diego and other cities are publicly and politically challenging the primarily boomer-dominated homeowner associations seeking to keep apartment bans in their neighborhood. But growth requires organizations. And YIMBY Democrats of San Diego offers people a roadmap for creating similar groups in their own cities. It starts with spreading the word on social media, connecting to the many people in all cities who tweet about the need for more housing. I noticed that in the past month Cupertino For All formed and is rapidly gaining followers on Twitter (Cupertino For All‏ @Cupertino4All ) I’ve heard from people in Fremont, California eager to start a YIMBY group and similar efforts are emerging in other cities. It’s also important to hold meetings in a fun environment conducive to the social interactions that sustain movements. 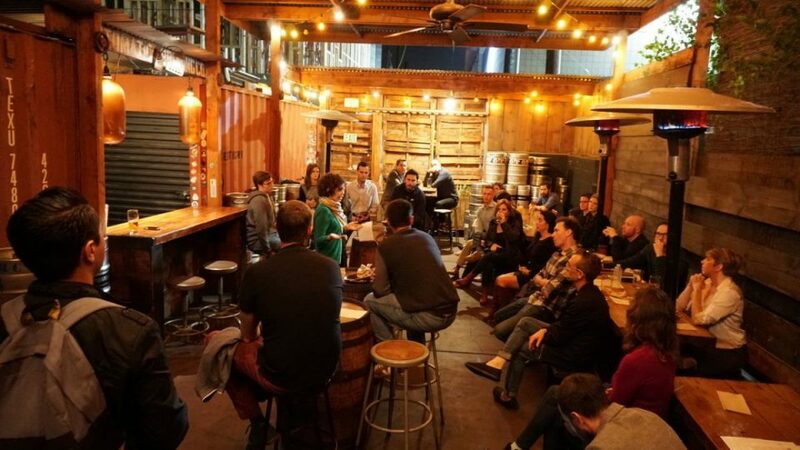 YIMBY Democrats meet in a bar (see photo above), which is common for other YIMBY groups. Rosas sees the Launch Party strategy as the critical building block for organizations. She also believes getting chartered as a Democratic Club really builds political support, and that certainly is true in deeply blue California. San Diego has a mayor’s race in November 2020 and candidates are already pushing to win YIMBY Democrats support. San Diego’s transformation into a pro-housing town is also very good news for California politics. So if you support more housing in your city and feel that others have similar views but that no organization exists, check out San Diego. When I interviewed. Maya Rosas in 2017 she had so much energy but lacked an organization; less than two year later YIMBY Democrats of San Diego are a force to be reckoned with.